John Legagneuk looks over the Tapis Rouge neighborhood at sunset on Friday, December 19, 2014 in Port-au-Prince, Haiti. Legagneuk lost his arm in a car accident in 2012. A vodou temple in the Fort National neighborhood on Thursday, December 18, 2014 in Port-au-Prince, Haiti. Fort National was among the hardest hit areas of Port-au-Prince in the 2010 earthquake, but rebuilding has been slow to non-existent. Residents still mostly lack electricity and running water. People march during an anti-government protest on Tuesday, December 16, 2014 in Port-au-Prince, Haiti. President Michel Martelly was elected in 2010 with great hope for reforms, but in the wake of slow recovery and parliamentary elections that are three years overdue, his popularity has suffered tremendously, forcing Prime Minister Laurent Lamothe to resign. Police keep watch from the back of a pickup truck during an anti-government protest on Tuesday, December 16, 2014 in Port-au-Prince, Haiti. President Michel Martelly was elected in 2010 with great hope for reforms, but in the wake of slow recovery and parliamentary elections that are three years overdue, his popularity has suffered tremendously, forcing Prime Minister Laurent Lamothe to resign. Morgue workers retrieve the body of Jolin Nicolas, 19, who was killed by police while participating an anti-government protest on Wednesday, December 17, 2014 in Port-au-Prince, Haiti. Worshipers at L'Eglise Evangelique Piscine de Bethesda, the church of televangelist Marcorel Zidor, on Saturday, December 20, 2014 in Port-au-Prince, Haiti. Pastor Zidor attracts a large audience with his emotional services and miracle medical cures of dubious theraputic value. Steevenson Deus poses for a portrait while repairing his earthquake-damaged home on Thursday, December 18, 2014 in Port-au-Prince, Haiti. Fort National was among the hardest hit areas of Port-au-Prince in the 2010 earthquake, but rebuilding has been slow to non-existent. Residents still mostly lack electricity and running water. Children gather at the start of their school day on Wednesday, December 17, 2014 in Port-au-Prince, Haiti. 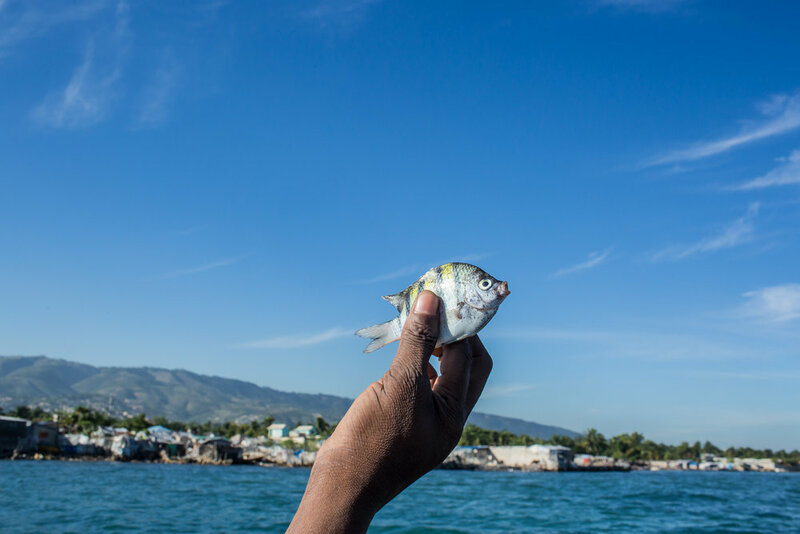 A small fish caught for eating by fishermen Jean Claude Pierre and Jean Claude Joseph on Monday, December 15, 2014 in Port-au-Prince, Haiti. A boy wears a top hat he made himself out of cardboard as local residents work on repairing their houses on Thursday, December 18, 2014 in Port-au-Prince, Haiti. Fort National was among the hardest hit areas of Port-au-Prince in the 2010 earthquake, but rebuilding has been slow to non-existent. Residents still mostly lack electricity and running water. 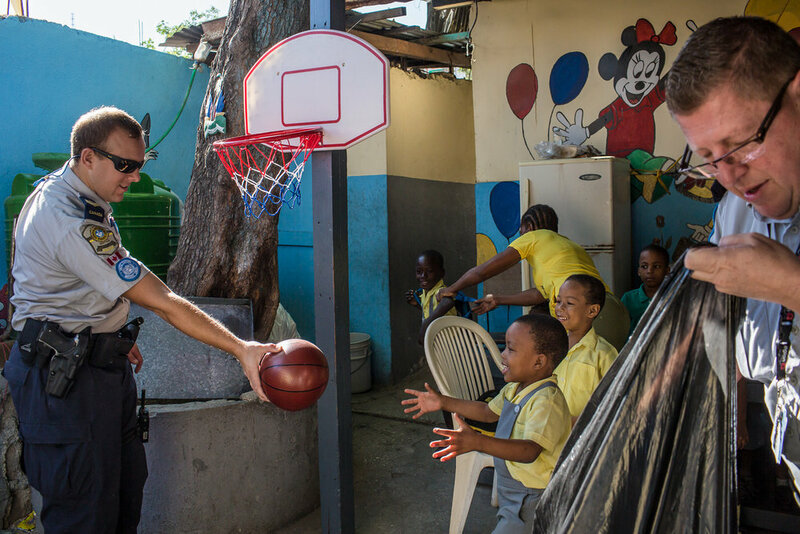 Simon Leblanc, left, and Robert Gagnon, police officers from Montreal, Canada, deliver toys and school supplies to students at Ecole Mixte Louis St. Juste in the Fort National neighborhood on Friday, December 19, 2014 in Port-au-Prince, Haiti. Though the officers were stationed in Haiti under the auspices of MINUSTAH, the supplies were purchased privately by the officers and their friends. Fort National was among the hardest hit areas of Port-au-Prince in the 2010 earthquake, but rebuilding has been slow to non-existent. Residents still mostly lack electricity and running water. A UN peacekeeping soldier from Brazil, operating under the auspices of MINUSTAH, at his base in Fort National on Tuesday, December 16, 2014 in Port-au-Prince, Haiti. The UN has a controversial record in Haiti, and is extremely unpopular. 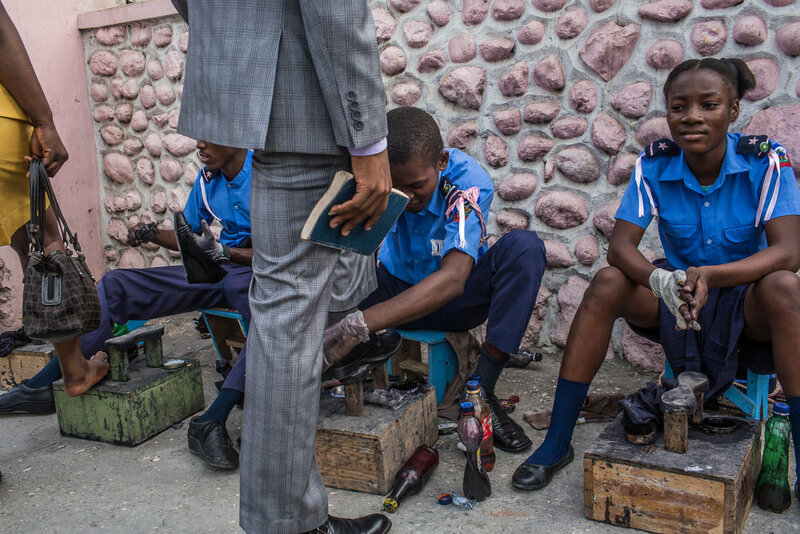 Children shine shoes to raise money for their church on Sunday, December 14, 2014 in Port-au-Prince, Haiti. 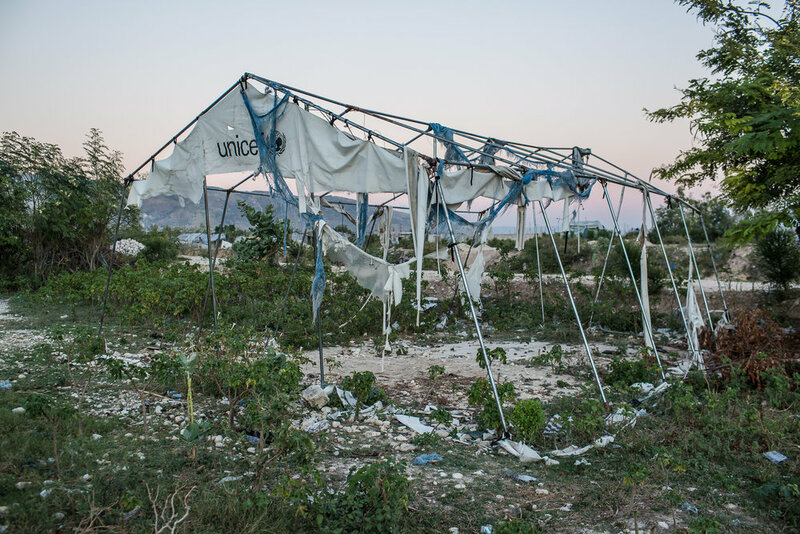 A tent donated by UNICEF which was formerly used as a church stands in tatters at the Corail-Cesselesse camp for people displaced by the 2010 earthquake on Saturday, December 20, 2014 in Port-au-Prince, Haiti. The camp is home to tens of thousands of people, for most of whom there is no work or easy access to the center of town, some 18 kilometers away. Kitchen workers at a restaurant in the Tapis Rouge neighborhood on Monday, December 22, 2014 in Port-au-Prince, Haiti. The restaurant was initially funded as a government program, and is required to serve meals that cost the equivalent of less than 25 cents US, which both provides cheap food for residents and a local business for entrepreneurs. Men unload bags of rice from a truck on Friday, December 19, 2014 in Port-au-Prince, Haiti. While Haiti was once self-sufficient in rice production, cheap imported rice, particularly from America, has put many Haitian rice farmers out of business. 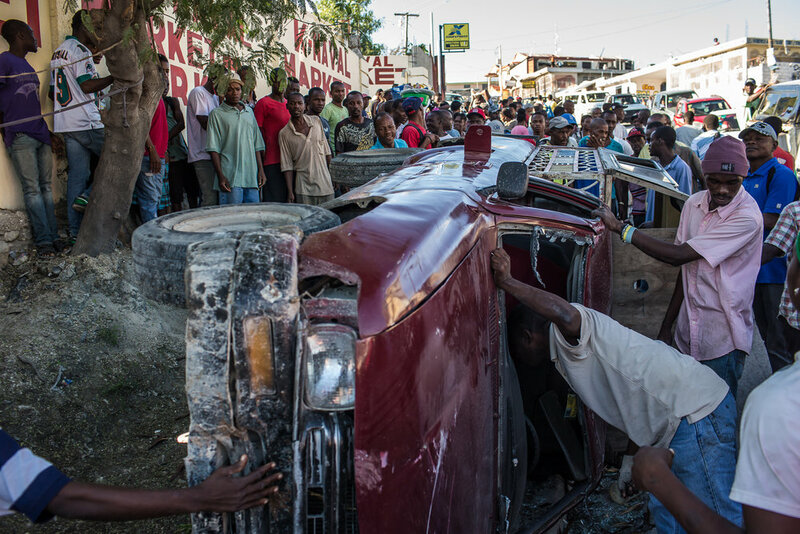 A tap-tap which flipped over during a morning rush-hour accident is inspected by a curious crowd on Thursday, December 18, 2014 in Port-au-Prince, Haiti. No one was injured in the accident. 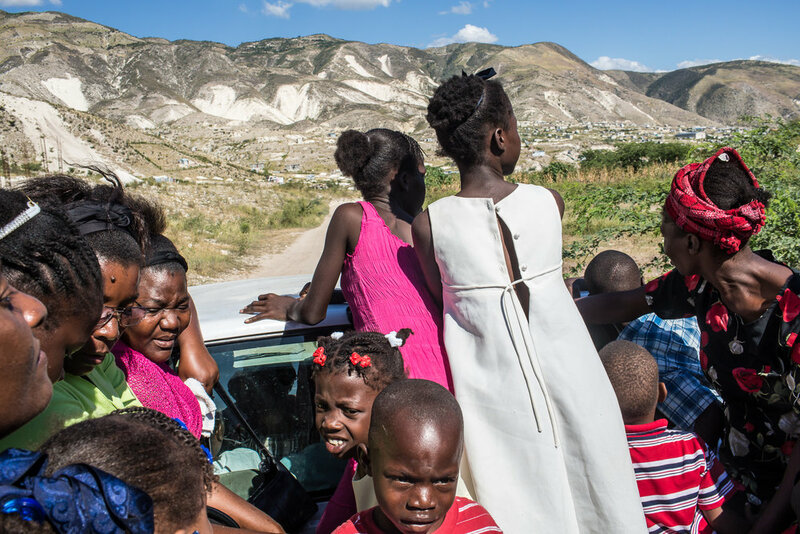 Worshipers catch a ride to their homes in the back of a pickup truck following services at Church of God for Fighting Pentecostal Church on the edge of the Corail-Cesselesse camp for people displaced by the 2010 earthquake on Sunday, December 21, 2014 in Port-au-Prince, Haiti. The camp and surrounding areas are home to tens of thousands of people, many of whom live in makeshift shacks in a barren landscape with little or no access to jobs or resources. Owner Benoit Jean Wilfrid, right, collects money as people clamour for a plate of food at a restaurant in the Tapis Rouge neighborhood on Monday, December 22, 2014 in Port-au-Prince, Haiti. The restaurant was initially funded as a government program, and is required to serve meals that cost the equivalent of less than 25 cents US, which both provides cheap food for residents and a local business for entrepreneurs. An anti-government protester throws a rock at pro-government supporters on Tuesday, December 16, 2014 in Port-au-Prince, Haiti. President Michel Martelly was elected in 2010 with great hope for reforms, but in the wake of slow recovery and parliamentary elections that are three years overdue, his popularity has suffered tremendously, forcing Prime Minister Laurent Lamothe to resign. 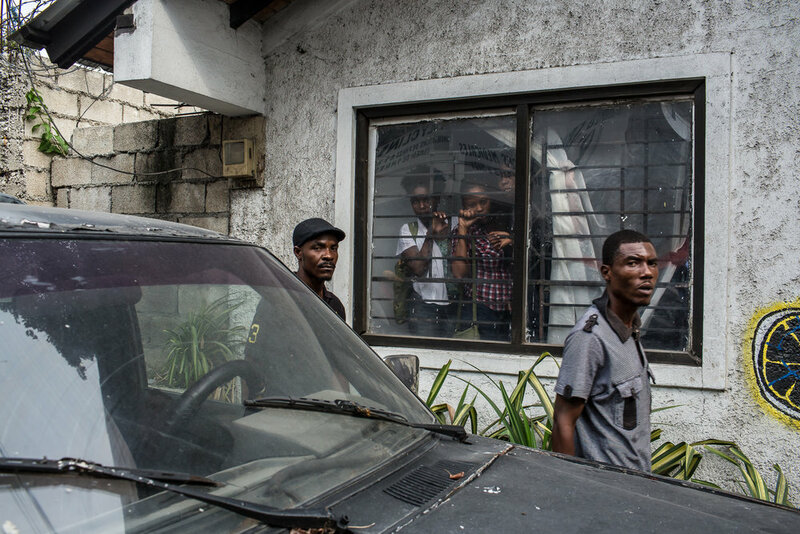 Anti-government protesters confront a pro-government man accused of stealing a cell phone on Tuesday, December 16, 2014 in Port-au-Prince, Haiti. President Michel Martelly was elected in 2010 with great hope for reforms, but in the wake of slow recovery and parliamentary elections that are three years overdue, his popularity has suffered tremendously, forcing Prime Minister Laurent Lamothe to resign. 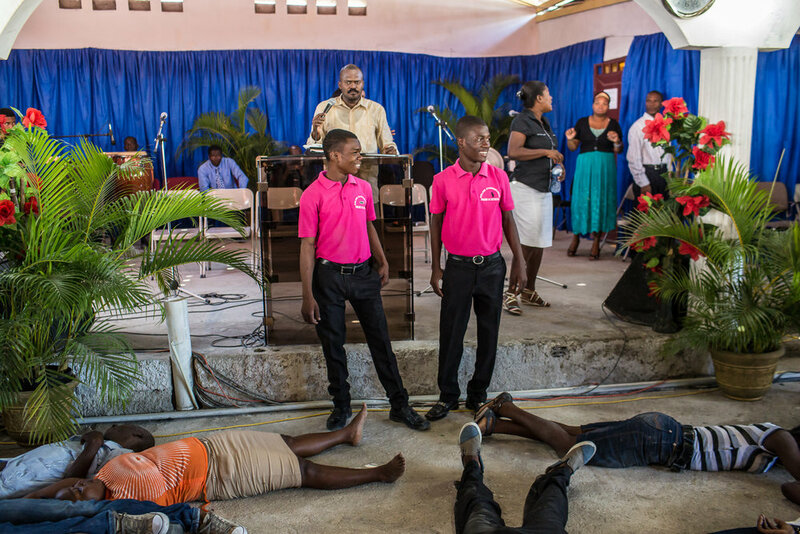 Ushers look over worshipers who have been overcome with religious fervor at L'Eglise Evangelique Piscine de Bethesda, the church of televangelist Marcorel Zidor, on Saturday, December 20, 2014 in Port-au-Prince, Haiti. Pastor Zidor attracts a large audience with his emotional services and miracle medical cures of dubious theraputic value. Worshipers who have been overcome with religious fervor lie in a heap on the floor at L'Eglise Evangelique Piscine de Bethesda, the church of televangelist Marcorel Zidor, on Saturday, December 20, 2014 in Port-au-Prince, Haiti. Pastor Zidor attracts a large audience with his emotional services and miracle medical cures of dubious theraputic value. 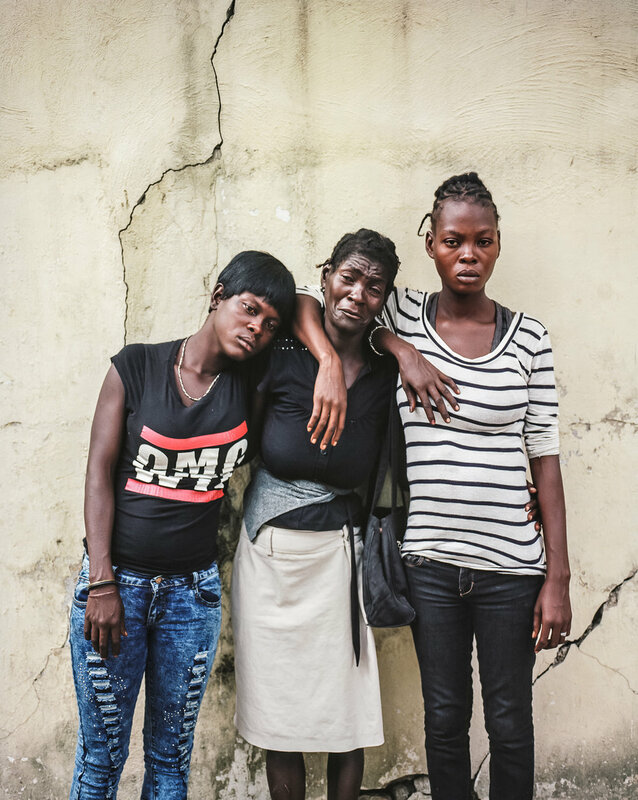 Claudiani Fonrose, third from left, and Bertha Nicolas, 20, second from right, grieve at the funeral of Jolin Nicolas, 19, on Monday, December 22, 2014 in Port-au-Prince, Haiti. Jolin Nicolas, their son and brother, respectively, was killed by police while participating in anti-government protests on December 13. Mourners carry the casket of Jolin Nicolas, 19, on Monday, December 22, 2014 in Port-au-Prince, Haiti. Nicolas was killed by police while participating in anti-government protests on December 13, and many of the mourners came from political groups such as MOPOD, a block of opposition political parties, and Klere J'aie Ayiti that are aligned against President Michel Martelly. Betty Nicolas, 23, Claudiani Fonrose, and Bertha Nicolas, 20, from left, pose for a picture on Monday, December 15, 2014 in Port-au-Prince, Haiti. They are the sisters and mother of Jolin Nicolas, 19, who was killed while participating in an anti-government protest on December 13. The Tapis Rouge neighborhood on Friday, December 19, 2014 in Port-au-Prince, Haiti. Emmanuel Deus, a musician, poses for a portrait at his home on Thursday, December 18, 2014 in Port-au-Prince, Haiti. Fort National was among the hardest hit areas of Port-au-Prince in the 2010 earthquake, but rebuilding has been slow to non-existent. Residents still mostly lack electricity and running water. 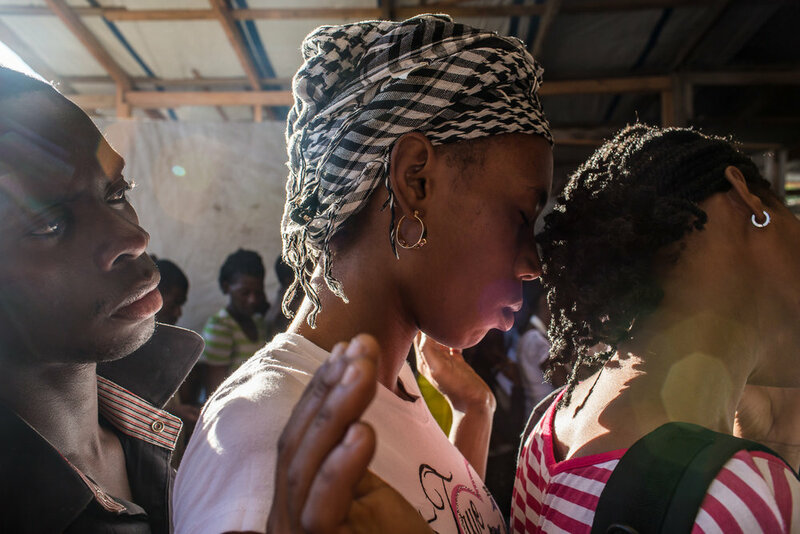 Worshipers prepare to leave following services at Church of God for Fighting Pentecostal Church on the edge of the Corail-Cesselesse camp for people displaced by the 2010 earthquake on Sunday, December 21, 2014 in Port-au-Prince, Haiti. The camp and surrounding areas are home to tens of thousands of people, many of whom live in makeshift shacks in a barren landscape with little or no access to jobs or resources. 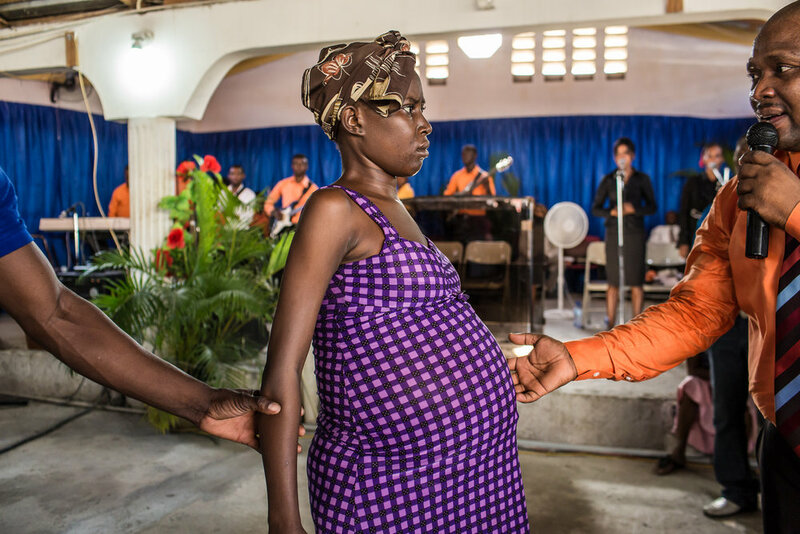 Televangelist Marcorel Zidor, right, attempts to cure a woman of an unspecified medical ailment (she is not pregnant) at L'Eglise Evangelique Piscine de Bethesda in its temporary home on Saturday, December 20, 2014 in Port-au-Prince, Haiti. Pastor Zidor attracts a large audience with his emotional services and miracle medical cures of dubious theraputic value. A solar-powered street light illuminates the Corail-Cesselesse camp for people displaced by the 2010 earthquake on Saturday, December 20, 2014 in Port-au-Prince, Haiti. The batteries for the lights are wearing out, and many do not last for more than a few hours. The camp is home to tens of thousands of people, for most of whom there is no work or easy access to the center of town, some 18 kilometers away. 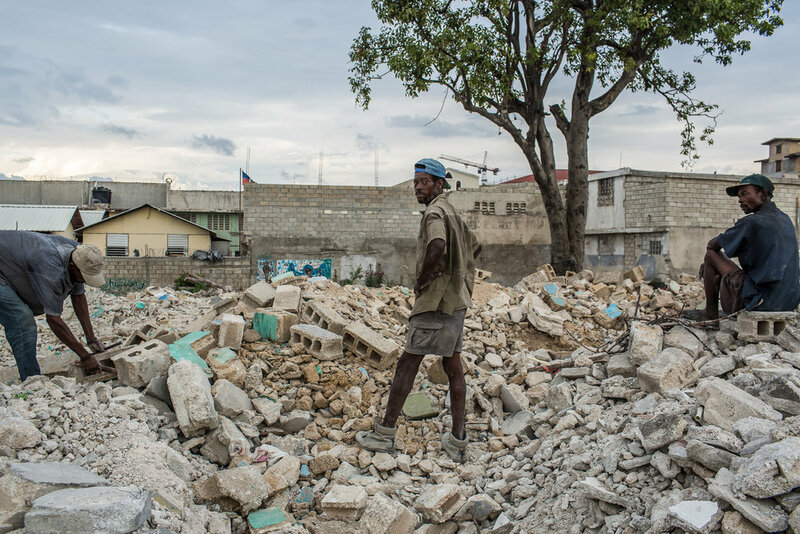 Men salvage usable concrete blocks from the rubble of demolished buildings on Sunday, December 14, 2014 in Port-au-Prince, Haiti. Several square blocks of residences and small businesses have been demolished near the city center, with no warning to residents or compensation for renters, to make way for an expected development project. 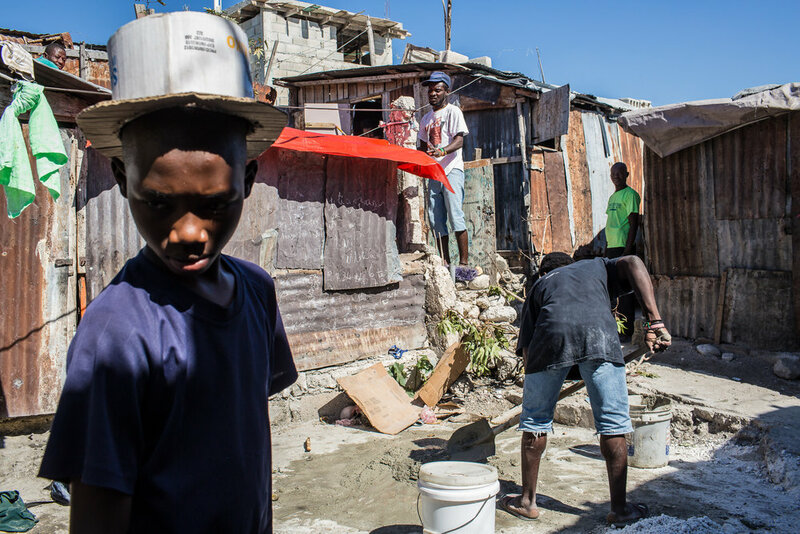 Five years after the devastating 2010 earthquake that killed an estimated 250,000 people, Haiti continues to struggle. 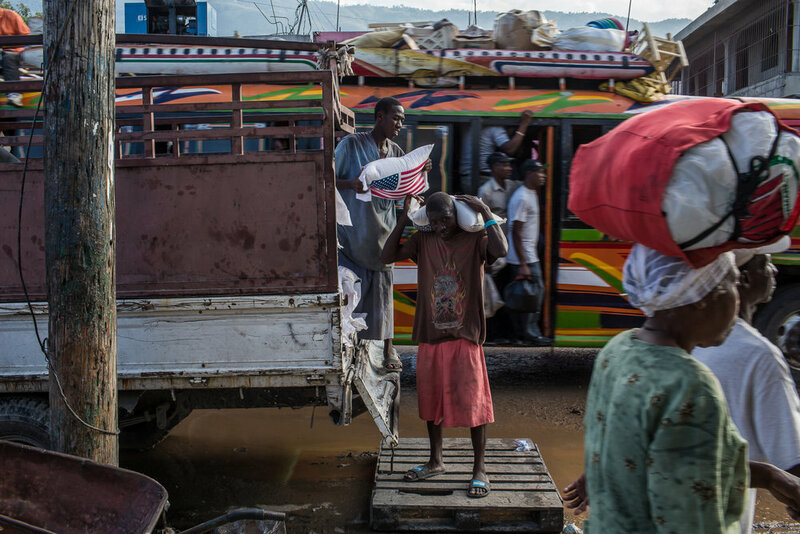 Despite the tremendous resources and ideas brought to bear, intended once and for all to set right Haiti's development and governance challenges, many of the issues that have plagued the country for decades, including corruption, violence, dependence on foreign assistance, and poor infrastructure, remain deeply entrenched. Hopes raised high have fallen, replaced in the minds of many Haitians by bitter resentment that they have once again been exploited and forgotten.